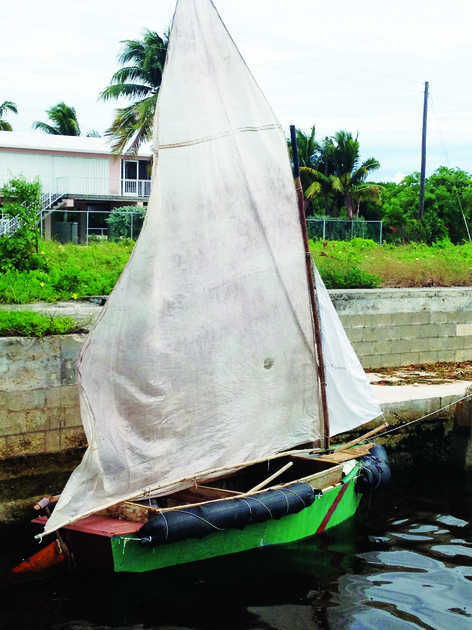 KEY WEST – Six men from Cuba came ashore in Key Largo Thursday morning on a dilapidated, makeshift sailboat that didn’t look fit enough for a pond, let alone the Florida Straits. The men spent eight days at sea on the boat, which was buoyed by what appeared to be a tractor-trailer truck tire fashioned to the front of the vessel. South Florida and the Caribbean have been experiencing typical late-summer thunderstorms several times a day for the past few weeks. The migrants’ final hours at sea off Key Largo were spent sailing through torrential downpours, thunder and lightning and, according to the National Weather Service, wind gusts up to 25 mph. But apparently the men thought it was worth the risk, according to Key Largo-area residents who first saw them come ashore around 7 a.m.
“I could give any American $1 million, and their faces wouldn’t look anything like the look on those people’s faces,” Patrick O’Neill said. After seeing the vessel, O’Neill finds it incredible that the men made it as far as they did, especially through Thursday morning’s storm. “It was howling, that’s why I was awake,” he said. But the men were in good spirits and appeared to be healthy. One of the migrants asked Dan Scroggins if he could use his cell phone to call a relative in New Jersey. “He just told him that they made it here all right,” Scroggins said. Thursday’s migrants are part of a wave of migrants coming from Cuba fearing that if they wait any longer, they will soon lose their political refugee status. The U.S. Coast Guard repatriated 121 Cuban migrants to Bahia de Cabañas, Cuba, this past week. And since Oct. 1, 2014, the Coast Guard 7th District estimates that 4,308 Cubans have attempted to illegally migrate via the sea. The numbers represent the total amount of at-sea interdictions, landings and disruptions in the Florida Straits, the Caribbean and Atlantic. According to a recent Wall Street Journal article, more than 31,300 Cubans entered the U.S. during the fiscal year, which ends in October. In 2010, that number was about 7,500. What’s changed is Cuba and the U.S. are becoming friendlier diplomatically, and the Cuban people fear the U.S. government soon may not be as welcoming to migrants from the island nation as it has been since the 1950s. A major part of the 1995 revision to the 1966 Cuban Adjustment Act is the so-called wet-foot, dry-foot policy. This means that Cubans stopped at sea are generally sent back home. But those who make it to land, like the men in Key Largo this week, can stay and apply for permanent residency after one year. The Obama administration has strengthened ties with the communist Castro regime this year. The U.S. and Cuba reopened embassies in each other’s countries over the summer. Since the nations are no longer foes per se, some question the rationality of continuing to grant all migrants coming from Cuba refugee status. Paolo Spadoni, a Cuba expert and assistant professor of political science at Georgia Regents University, said the Obama administration could repeal wet-foot, dry-foot with executive action without Congress repealing the entire Cuban Adjustment Act. The two nations are in ongoing negotiations, focusing now on issues like environmental protection. But Spadoni said the topic of human trafficking is expected to come up during the next round of meetings. Part of these talks could involve taking away the incentive of trying to make the journey to the U.S. without first legally obtaining a visa, i.e., doing away with wet-foot, dry-foot. “They don’t have to change the entire Cuban Adjustment Act,” Spadoni said. For now, the U.S. government maintains nothing has changed.